Traditional distillers are very inefficient, dissipating almost all input heat, and therefore have been dismissed by large water purification competitors. 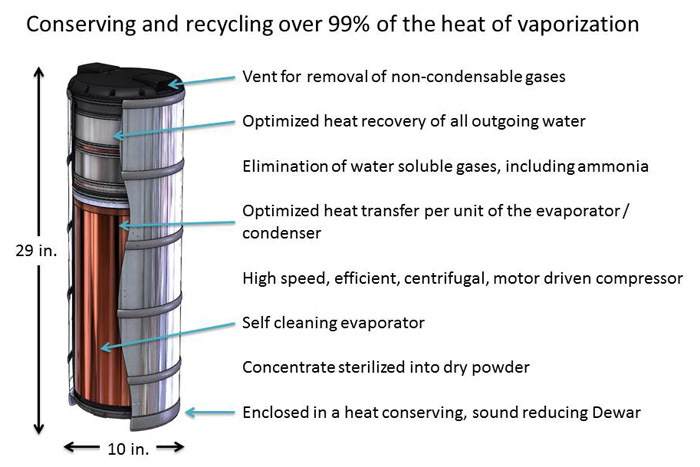 Vapor compression distillers typically capture about 50% of heat. A small handful of distillers, most notably distillers previously designed, built, and sold by Bill Zebuhr’s former companies, capture up to 98% of heat. Incremental but significant improvements using breakthrough design approaches make Aquaback superior to competing technologies. An improvement from 98% to 99% heat capture halves operating power consumption costs. All water produced is free of bacteria, viruses, heavy metals, radioactivity, mercury, lead, fluoride, arsenic, asbestos, MTBE, TCE, chromium 6, perchlorate, odor and other chemicals or pharmaceuticals that may be harmful alone or in combination but have not yet been recognized or classified as dangerous by regulators. All products outperform competing equipment and processes at any scale in all performance categories simultaneously, including water quality, capital and operating costs, reliability, safety, and reject rate. These abilities give Aquaback significant competitive advantages. In addition to far superior water quality at the lowest overall cost, low reject rate allows for true recycling of water for any reuse purpose including consumption. Technology fundamentals and real time monitoring guarantee safety. At smaller scales Aquaback has no real competition because competing technologies require multiple purification steps in series to come close to producing equal water quality. At large scale, Aquaback systems have significantly lower capital costs, smaller footprints, lower operating costs and do not require chemicals, filters or other consumables. Aquaback has completed extensive theoretical and physical analysis to verify our design goals and performance. For more information about how vapor compression distillation works and our sub-assembiles, please Click Here to learn more.